Do you want to learn Italian? Rome could be the suitable city to do it! The hospitality and warm character of its people will make it easy for you to make new friends. Rome is a cosmopolitan city with so much to offer to the visitor, it is one of the perfect places in which to learn Italian. Scuola Leonardo da Vinci is situated in the centre of Rome, in the pedestrian area, halfway from the astounding Piazza Navona, Castel S. Angelo and St. Peter Basilica. This area, typically Roman, abounds with charming cafes, shops, boutiques, libraries and a vibrancy found nowhere else in the city. "Well, we cannot give you just one single reason why you should choose and come to our school to study Italian. We would need a long time to describe who we are, what can we do for you and how would we do it. But we can give you just a few hints. While we cannot guarantee you that you will be able to learn Italian in a few days, we will guarantee you we will do all that is possible, and sometime the impossible, to make Italian from the first day, your new language so you can practice on you own after class. 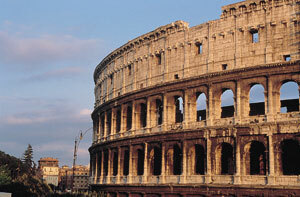 Our teachers are highly experienced and passionate; they want you to learn Italian. It’s their goal and mission, and it’s our goal and mission to make this happen. Teaching to them means a lot, more than what you might think. Our friendly staff is available to you all day long to accommodate your needs and solve your problems. Scuola Leonardo da Vinci is right in the “centro”, the historical center, five minutes away from the Vatican, piazza Navona, the Pantheon. Come to our school, and let the adventure of learning a new language and a new culture, an adventure that will broaden your horizons and goals, begin!!"